Why do some organizations learn at faster rates than others? Why do organizations "forget"? Could productivity gains acquired in one part of an organization be transferred to another? These are among the questions addressed in Organizational Learning: Creating, Retaining and Transferring Knowledge. Since its original publication in 1999, this book has set the standard for research and analysis in the field. 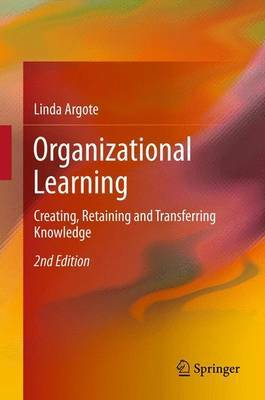 This fully updated and expanded edition showcases the most current research and insights, featuring a new chapter that provides a theoretical framework for analyzing organizational learning and presents evidence about how the organizational context affects learning processes and outcomes. Drawing from a wide array of studies across the spectrum of management, economics, sociology, and psychology, Organizational Learning explores the dynamics of learning curves in organizations, with particular emphasis on how individuals and groups generate, share, reinforce, and sometimes forget knowledge. With an increased emphasis on service organizations, including healthcare, Linda Argote demonstrates that organizations vary dramatically in the rates at which they learn-with profound implications for productivity, performance, and managerial and strategic decision making.